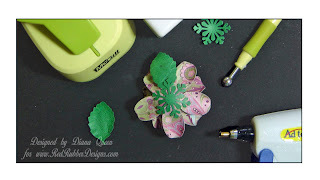 For this Tutorial I am going to show you a quick and easy stamping technique. 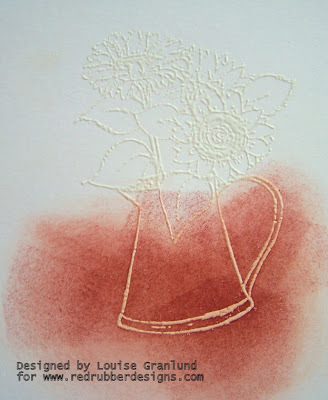 It's called the Emboss Resist Technique and basically is accomplished by embossing a stamped image in white or clear embossing powder. 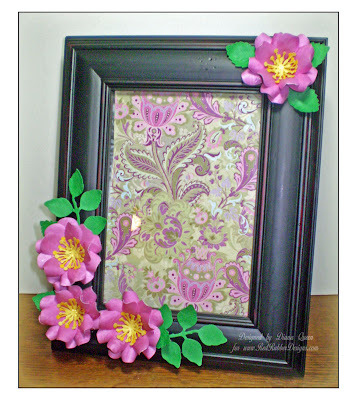 When color is added to your image the embossed area then resists your color leaving a striking outline. The card I created above includes an embossed image from the Red Rubber Designs Sunflowers stamp set. 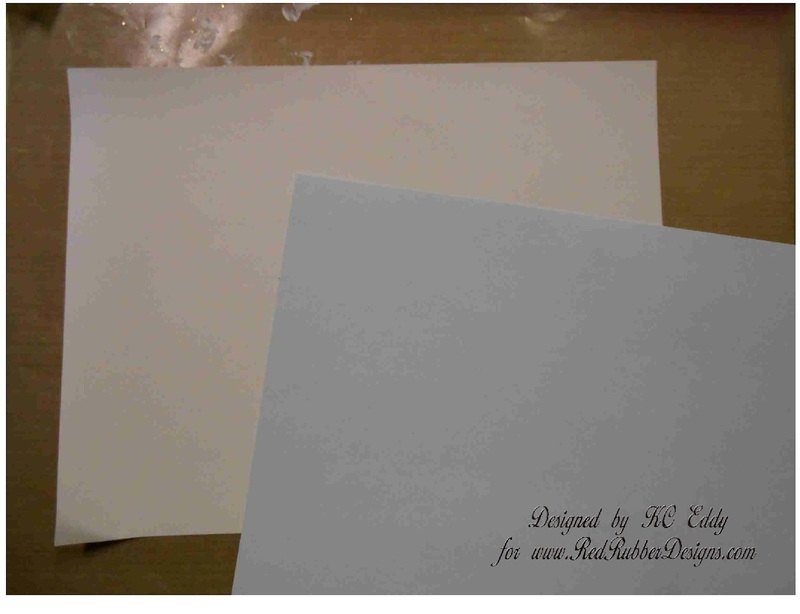 Although this technique can be used on colored cardstock and with colored embossing powder in a wide variety of combinations, what I have chosen for this project is white cardstock and white embossing powder. I'll also use a heat gun, my stamp, and then the medium with which I will add color. 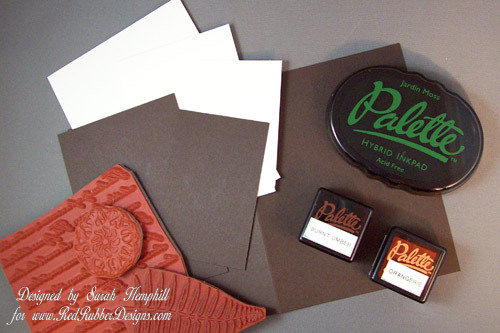 I have chosen to use the Palette Inks and will be applying my color with a sponge applicator. 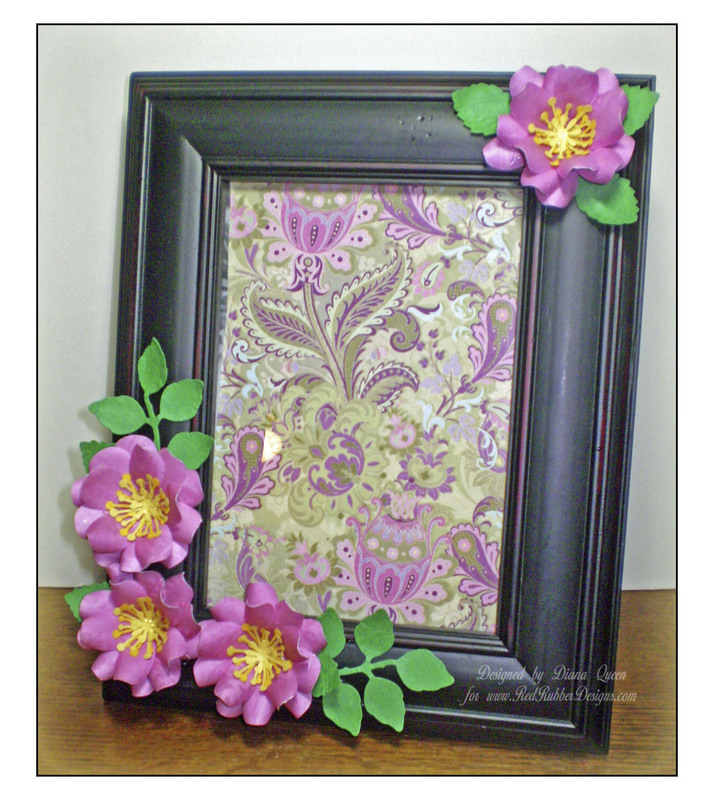 One of the fun aspects of this technique is the variety of ways you can add color to your embossed image. Markers, water color markers or crayons, distress inks will all work. To begin I've stamped my image with embossing ink and then heat embossed it with my white embossing power. 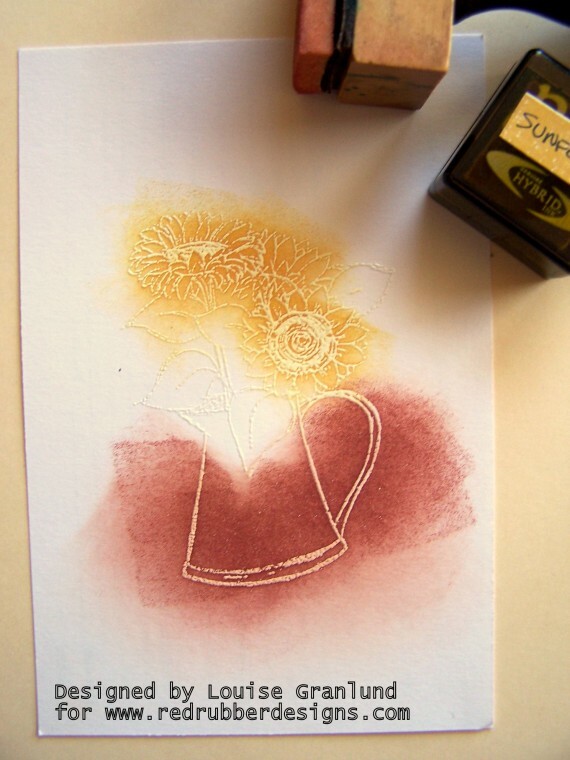 I now apply some of the yellow ink, appropriately called Sunflower, to my flowers. My final coloring step includes sponging some bright orange and green to my image. The white embossed area will really stand out. 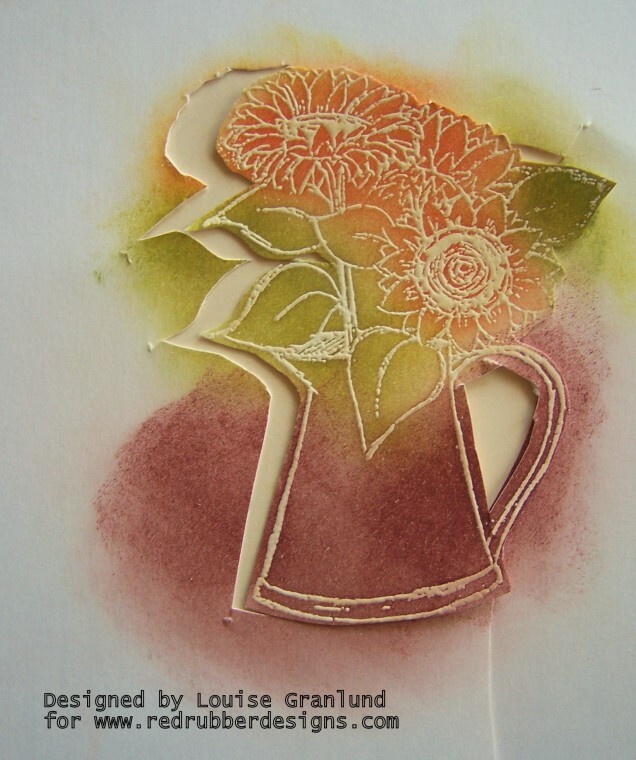 I have chosen to cut out my pot of sunflowers to use as a focal point for my card. Click here to download this tutorial in PDF form for FREE! This is one of those oldies but goodies that deserve to be revisited. I don’t know the exact name of the technique as I saw it many years ago at a stamp show at the booth of a company that has since gone out of business. I’ll just call it a layering technique for lack of a better name. Three pieces of cardstock in your choice of color for your card and mats. I used dark brown. Cut to the following dimensions. Cardstock for your stamping surface. 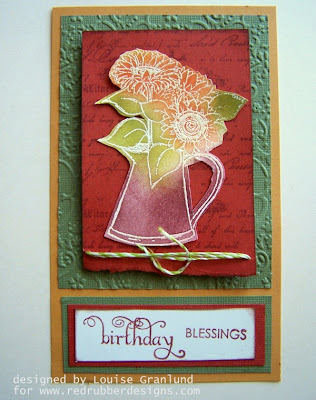 I used a cream colored cs. Cut to the following dimensions. The above dimensions are just a suggestion. You may wish to use other sizes. 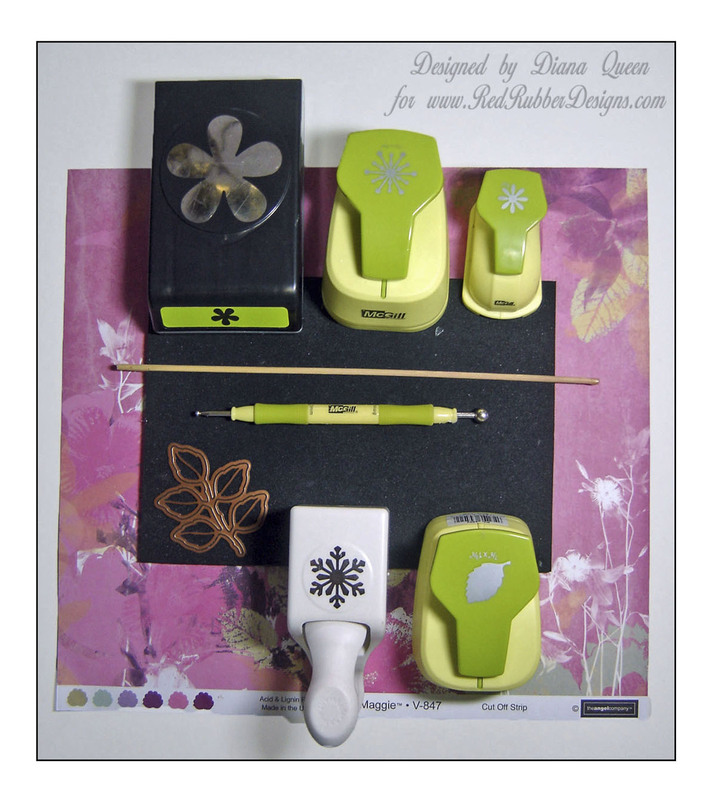 Your choice of stamps and ink colors. I used Palette inks in Jardin Moss, Orangerie, and Burnt Umber. 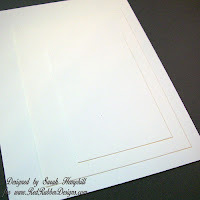 Take the 3 precut cardstock pieces and stack them on top of each other with the largest on the bottom, then the middle size and finishing with the smallest size on the top. They may be center stacked or off to one side. 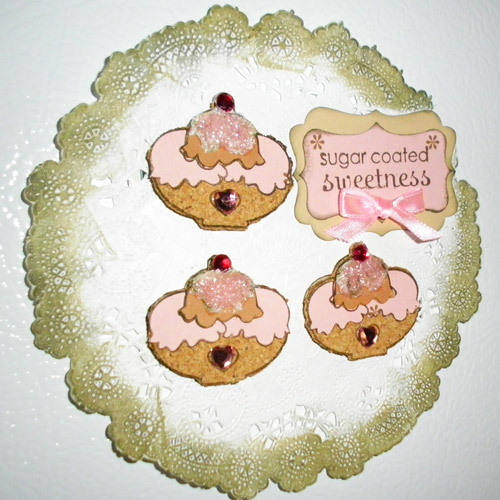 Allow at least a quarter of an inch allowance from the edge of each piece. You may use a small piece of repositionable adhesive on the back of each piece to keep the layers from slipping when you stamp on them. Start stamping your selected images. 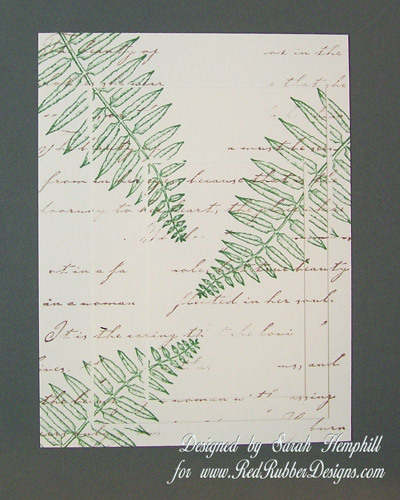 As you can see, I started with a script stamp (partially inked) then added the fern, then the floral medallion. Separate your three stamped pieces and adhere them to their respective mats. Line up your matted images paying attention to the continuity of the image. Add a greeting, ribbon or your choice of embellishments and you will have the non-stampers wondering how you created your card! You can download a FREE copy of this tutorial in the Red Rubber Designs store. 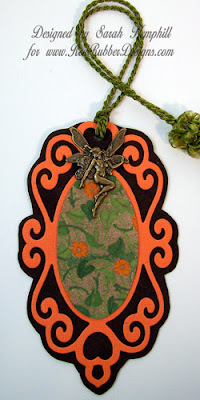 This month Red Rubber Designs has gone Vintage! 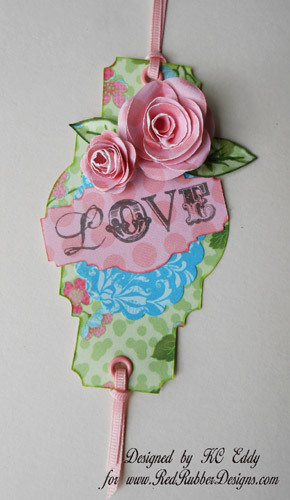 Whether it's romantic, grungy or retro - we have a vintage-style stamp for you! Also, click here to see the latest items now in the store. We try to keep costs low for you! Don't forget our Big Deal this month - all ribbon is 40% off (discount shows up in your cart). Do you love our featured stamps? Then check out our Bundles, the more you buy the more you save. Our Spotlight Stamp is always 40% off with every order. We have Grab Bags! 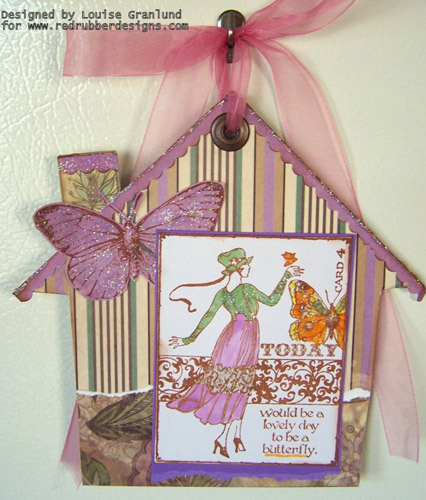 Stamps, charms and more! 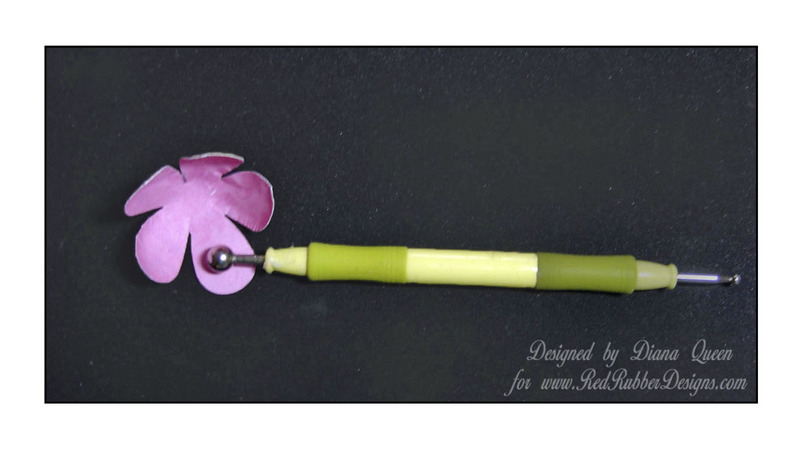 Check out the Red Rubber Designs store today! *United States, the U.S. Virgin Islands, Puerto Rico and APO Destinations. Stamps are great on fabric, but sometimes coloring techniques are tough - especially when the fabric has a heavy weave. Even T-shirt material can be a challenge to get nice coverage with markers or paint. 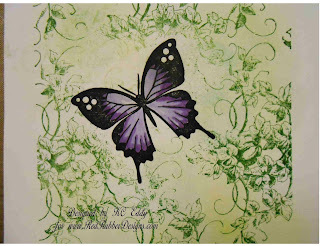 For this reason, I like to stamp on transfer paper and then iron the design onto fabric. 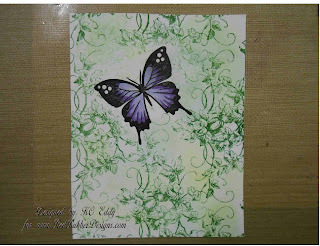 For this demonstration I'm using Inkjet transfer paper with a "soft hand". There are several brands on the market for this. Just be sure to get transfer paper that says "for white or light fabrics". The transfer paper I'm using has a white side and a blue side. 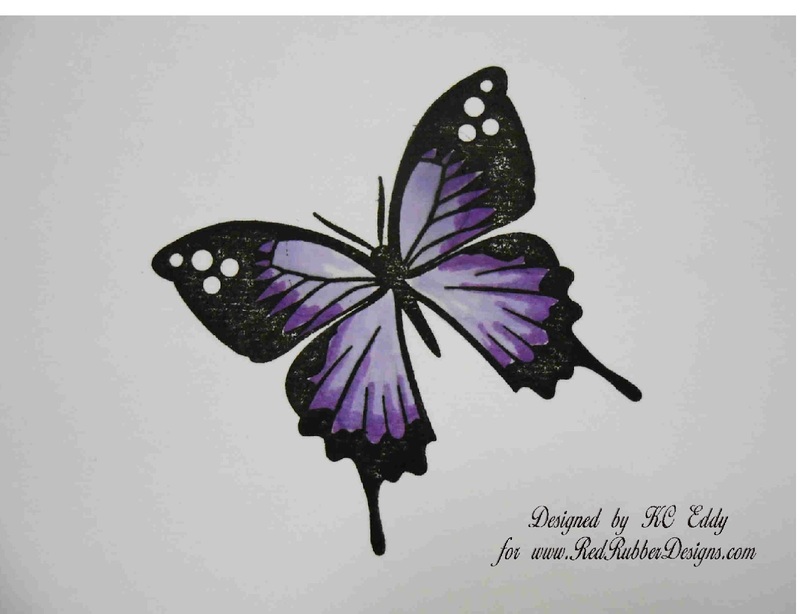 We will be working on the front of the transfer paper - the white side. When you iron your transfer to your fabric, you will be turning this upside down (blue side up, in this case), so to some extent you need to work your design in reverse. 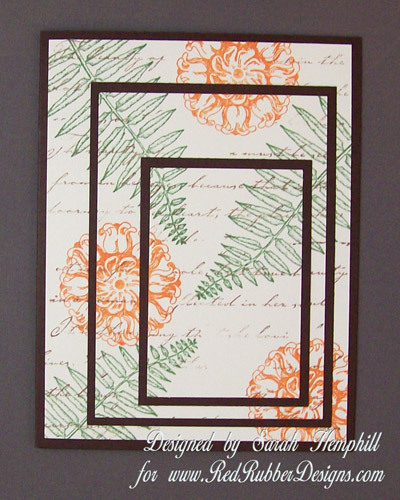 You will want to stamp the front, focal parts of your design first and backgrounds last. I began by stamping my butterfly from "Happily Grateful" stamp set in Palette Ink - Noir. Then I used Copic markers to color in the wings. 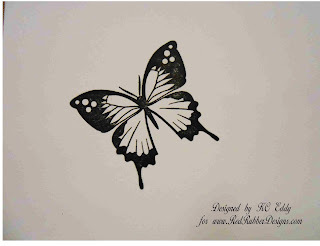 You can do shading on the transfer paper. Just be careful not to over saturate the paper or overwork a particular spot. If the white coating starts flaking or scraping away from the backing, you've over worked that area. 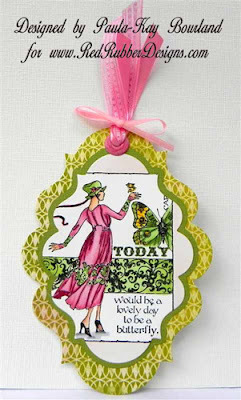 I stamped my background stamp, "Victorian Vines", in Palette Ink - Jardin Moss. 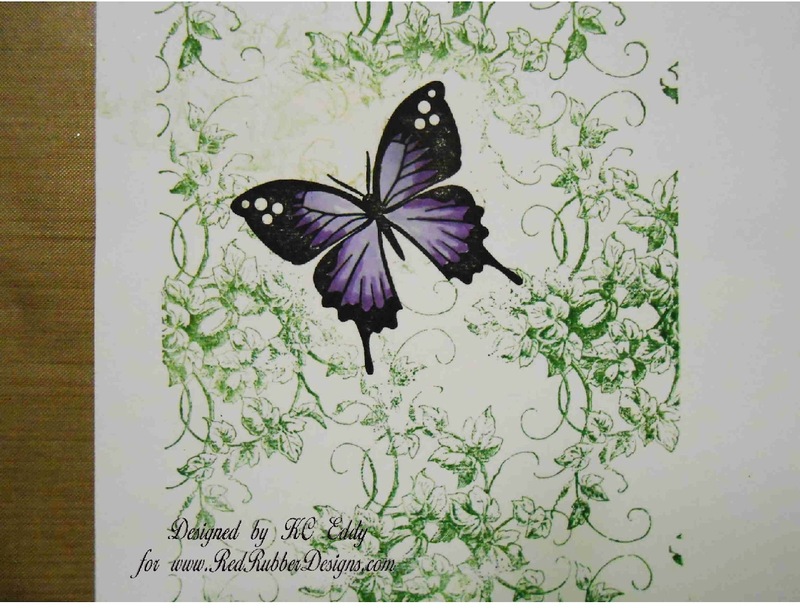 I did not ink the stamp in the approximate area that would end up on top of the butterfly. 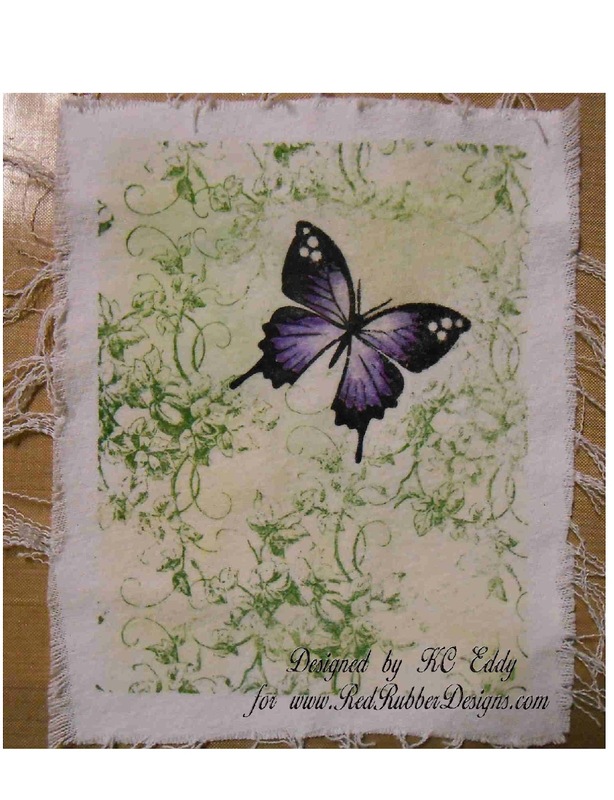 Even though this will be in the background when I iron the transfer on, I did not want the dark green leaves to show through the white or light purple areas of the butterfly. I used a large dobber to add a tint of color with Pallet Inks Chartreuse and Seascape. I then trimmed the transfer paper down to the size I wanted for my transfer. In this case it was down to the edges of the background stamp. Now for the fun part.....Though I love to use this technique for T-shirts, this time around I've cut up a pair of my daughter's old white jeans. Why I thought white jeans were a good idea for a 7 year old, I don't know, but when she was done with them they were way too stained to even send to Goodwill. I did manage to find a stain-free section big enough for my image. I cut it about 1" longer and wider than my image and then ran it through the washer and dryer to fray the edges. 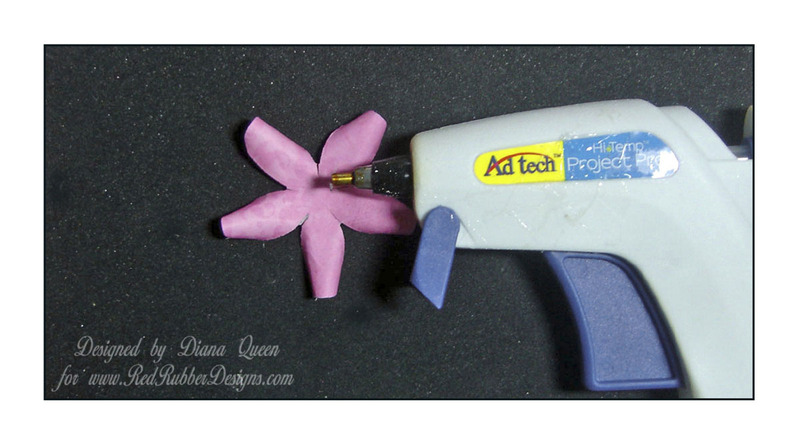 To iron your image on, you'll want to work on a hard surface. I use a small wooden cutting board. You'll need to put some pressure on the iron, so working on an ironing board pad is not recommended - a table or counter top works best. 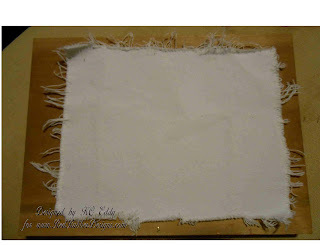 Iron the image, face down to your fabric, according to the instructions for your transfer paper. 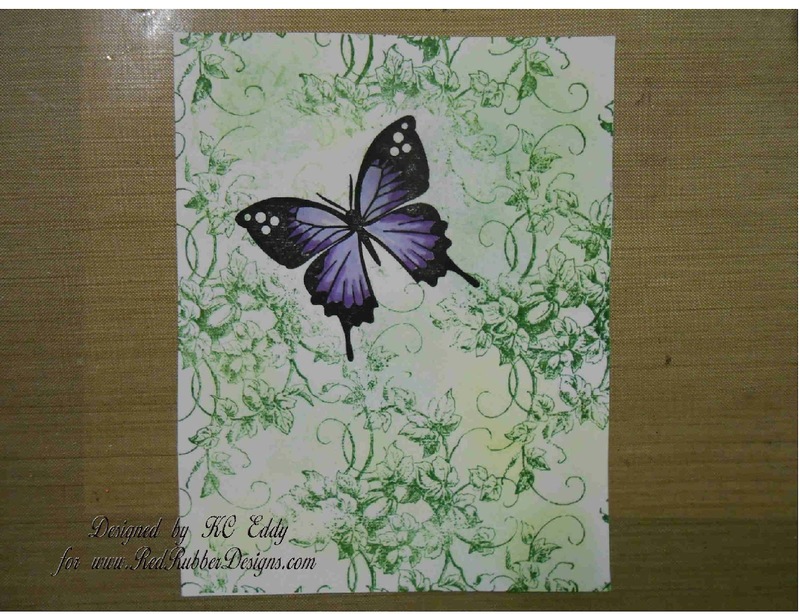 Check the image by lifting up one corner of the transfer paper. 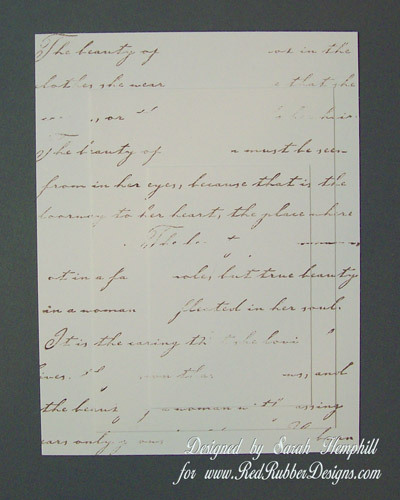 If the image has transferred to the fabric, carefully peel back the rest of the paper. If the image has not transferred, repeat the ironing process. You may need to turn up the heat on your iron, iron longer or use more downward pressure. 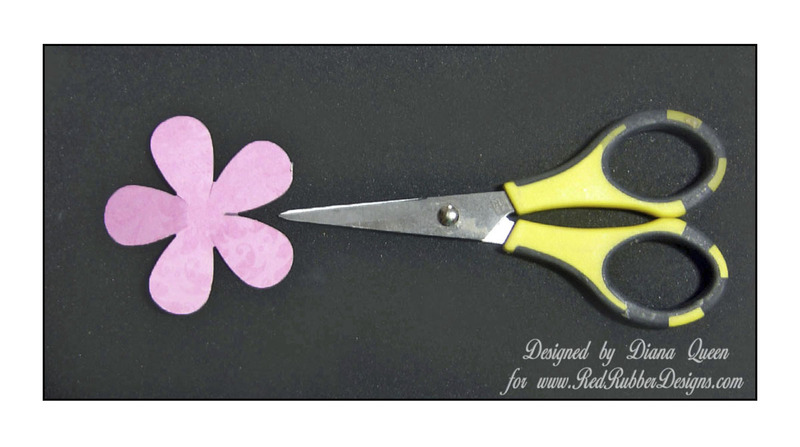 You may want to practice on some scrap fabric until you get a feel for it. I now have a stamped canvas that I can turn into a mixed media project, use in a mini-album, or other projects. 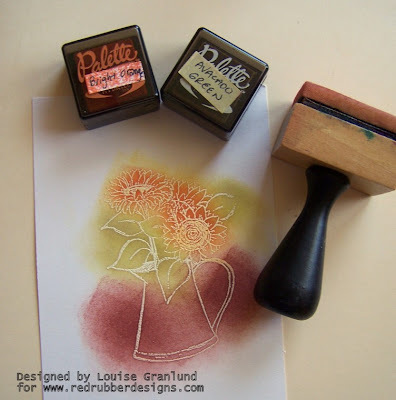 1 - Do not use stamps with words on your iron-on transfer - they will come out backwards when you iron on. 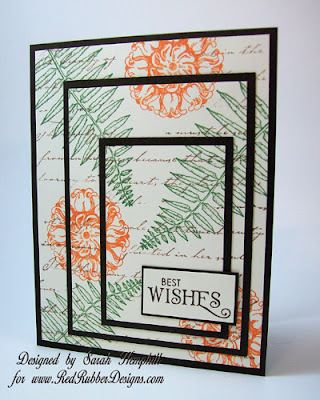 If you want to add words to your stamped design you have a couple of options. You can stamp on the back (blue side) of the transfer paper and then use a light box to trace the letters onto the front side. 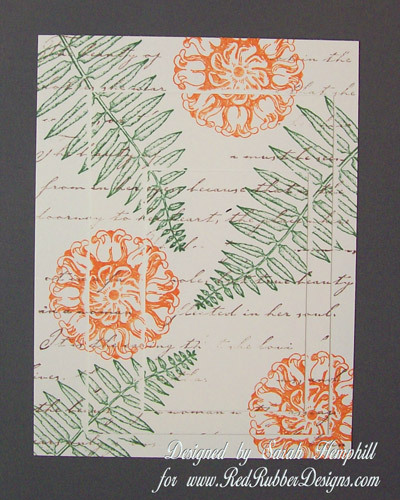 Or you can wait until after you've transferred your design to fabric and stamp the words directly to the fabric. 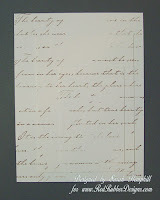 Depending on the weave of your fabric, you may get a distressed look to your letters where the stamp does not connect to fabric fibers. 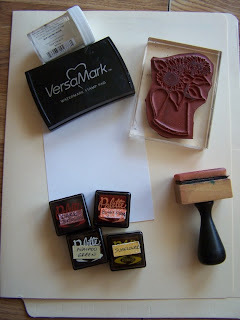 2 - If you are stamping on something you intend to wear, test your stamp ink to be sure it will hold up to washing. Stamp on a piece of scrap cloth similar to what you'll be stamping on for your project and run it through the wash a few times. I have used Palette inks and they seem to work very well. I hope you'll try this stamping technique! You can find a FREE download of this tutorial in the Red Rubber Designs store. 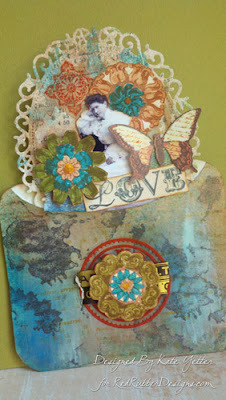 We had a great turnout for this month's contest that coincided with our First Thursday Blog Hop. Thank you to everyone who took the time to enter. The contest was to guess how many spools of thread were in this vintage canning jar. 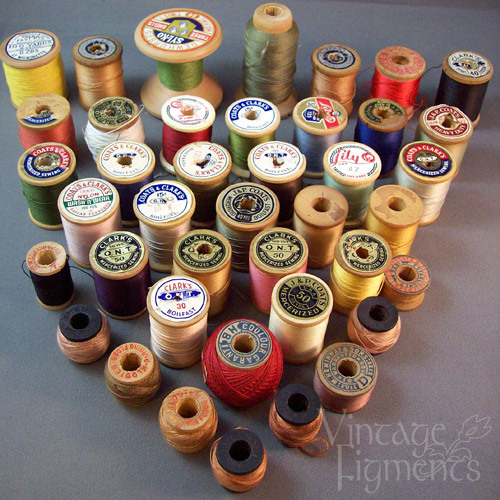 Here are all of the spools that were in the jar. The total count is 41. So many guesses were so close but we had one guess that was right on target. 41 is my guess. Love the new sets. Have a great night! Contact Pam at contest@RedRubberDesigns.com to collect your prize. Even if you didn't win, you can still get this stamp set at a 40% discount with any order made at Red Rubber Designs. What are you waiting for...get shoppin'! We're in a nostalgic mood this month at Red Rubber Designs. We are turning back the clock and flipping back the calendar to bring you a little vintage. You may even see vintage with a hint of contemporary flair just for fun. 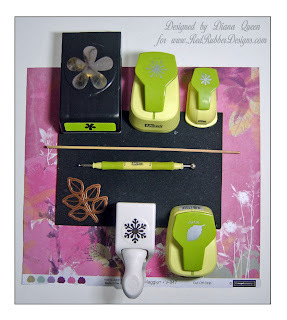 We have a blog hop for you as well as new stamp sets and a contest, too. Hope you'll join us! 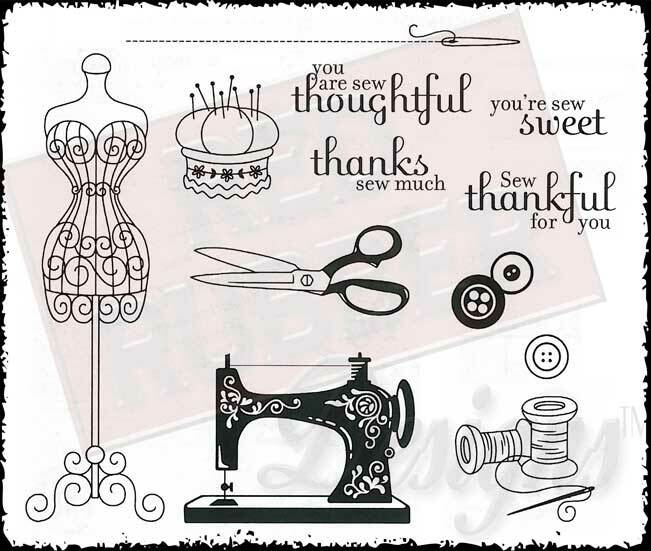 Our Spotlight Stamp Set this month and the one that you will see featured by the Design Team is Sew Thankful. 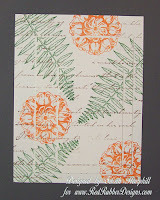 Spotlight Stamps are always 40% off with any order. What a great deal that is! Want to see all of the featured releases for September? You can find them here. Now, on to the contest. You'll have to put on your thinking cap for this one. In the following picture you will see a quart canning jar that contains wooden spools of thread. 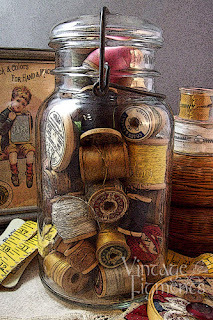 The contest is to guess how many spools are in the jar. Please send your guess (only 1 guess per player) to contest@RedRubberDesigns.com. One winner will be chosen from the correct answers. If there is no correct guess, the person who comes the closest will receive the spotlight stamp set "Sew Thankful". In case of a tie, a random draw will take place between those tied. Contest ends Sunday, September 9 at midnight (CDT). 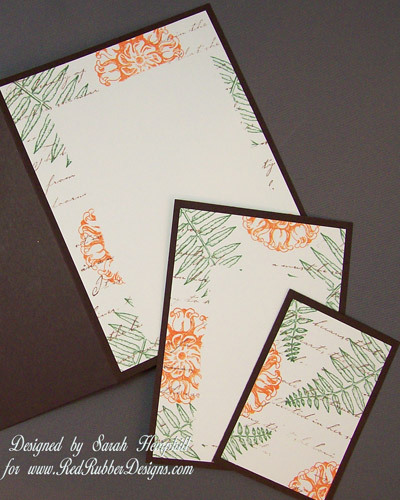 The Red Rubber Designs store carries really beautiful patterned card stock collections. 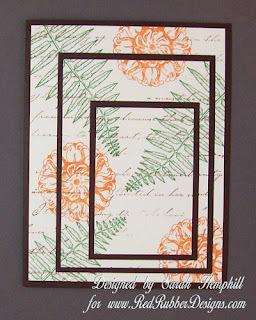 I thought it would be fun to share a project featuring the Maggie Patterned Card Stock Collection for this tutorial. This flower will be made using a five petal punch. These directions will apply to any size five petal punch. The other punches and supplies shown above are optional. Start by punching 3 five petal flowers. Then snip in between each petal about 1/8th an inch. This keeps your flower base from becoming too bulky. 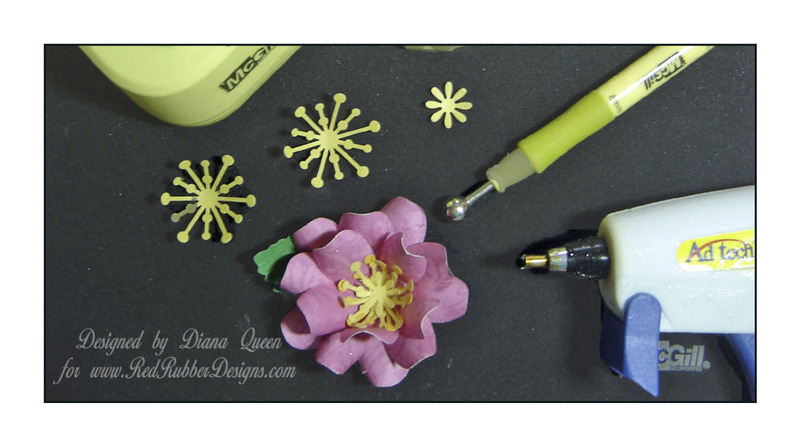 A ball stylus is a very helpful tool in sculpting your paper flower, but I have used the rounded end of a paintbrush as well. 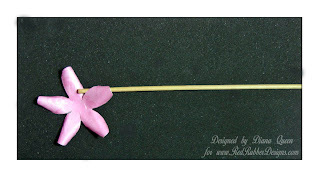 Gently roll the rounded end around in the flower center and around each petal. 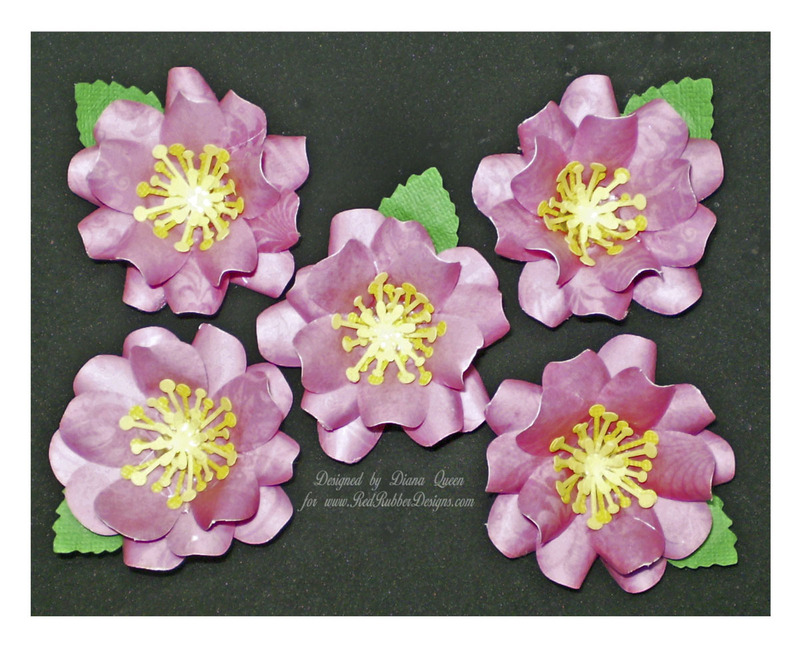 This breaks down paper's fibers and makes the petals easier to sculpt in the following step. 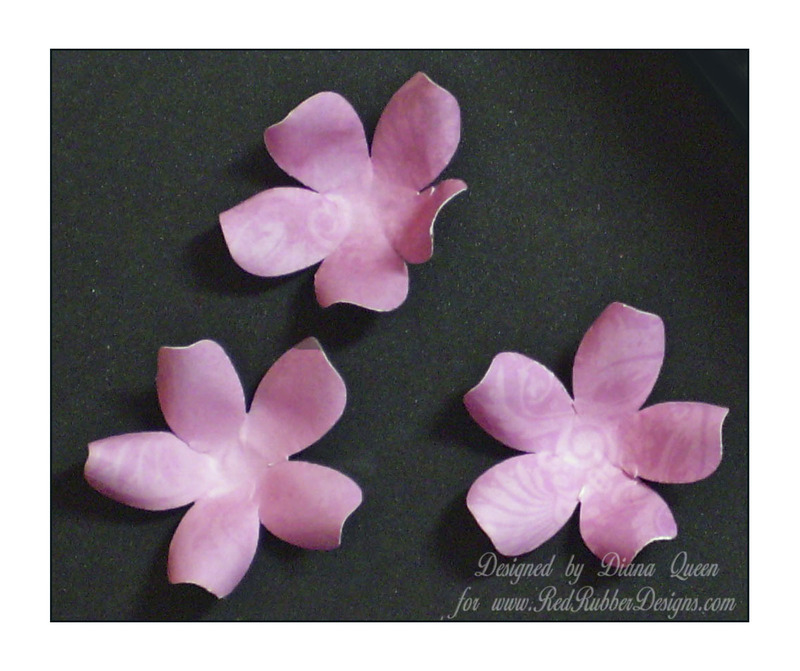 Your flower will form a cup shape. I used a little wooden grilling skewer from my kitchen. I've used small paint brush handles, pencils, etc. The skewer is a nice small diameter I like to work with. 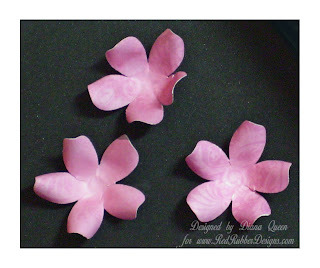 Now that I have 3 flowers with sculpted petals I'm ready to assemble my fun and fabulous flower! 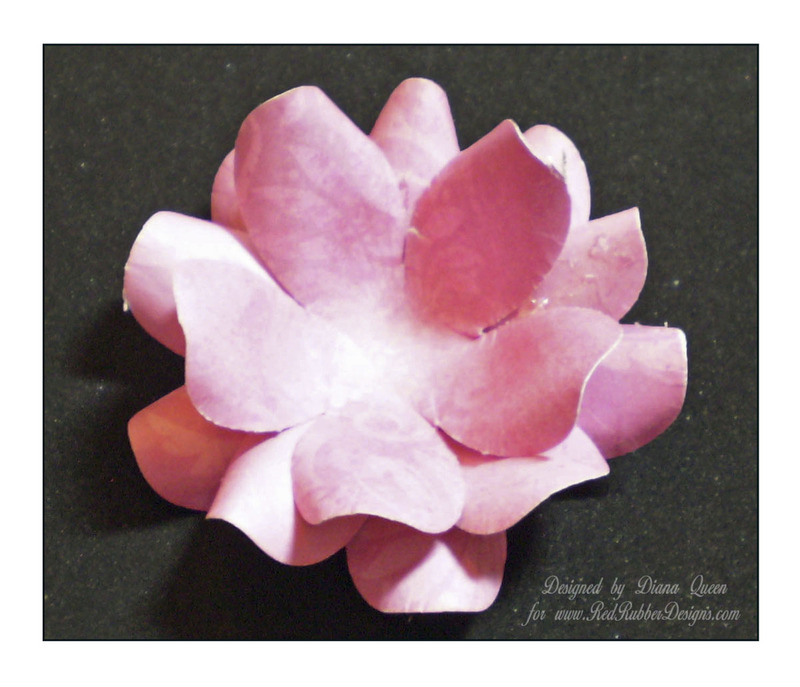 I used a glue gun, applying just a very small amount of glue to the center only of the first layer of my flower. Quick drying fabric glue works well too. Then I gently pressed the next flower layer into the glue staggering the flower petals as I go. And again for the third flower layer. 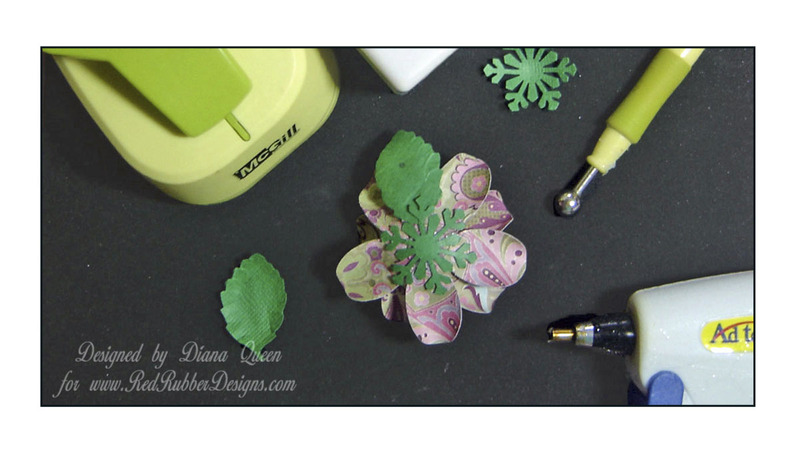 Once your 3 flower layers are together, flip it over and glue down the green card stock snowflake base. Add as many green card stock leaves as you like as well. I have used punches for the yellow card stock centers of my flowers... you can use smaller flower punches, brads, gemstones or whatever you choose for the center of your flower. These flowers are not only fun and fabulous but fast and easy... you'll have several made in no time! 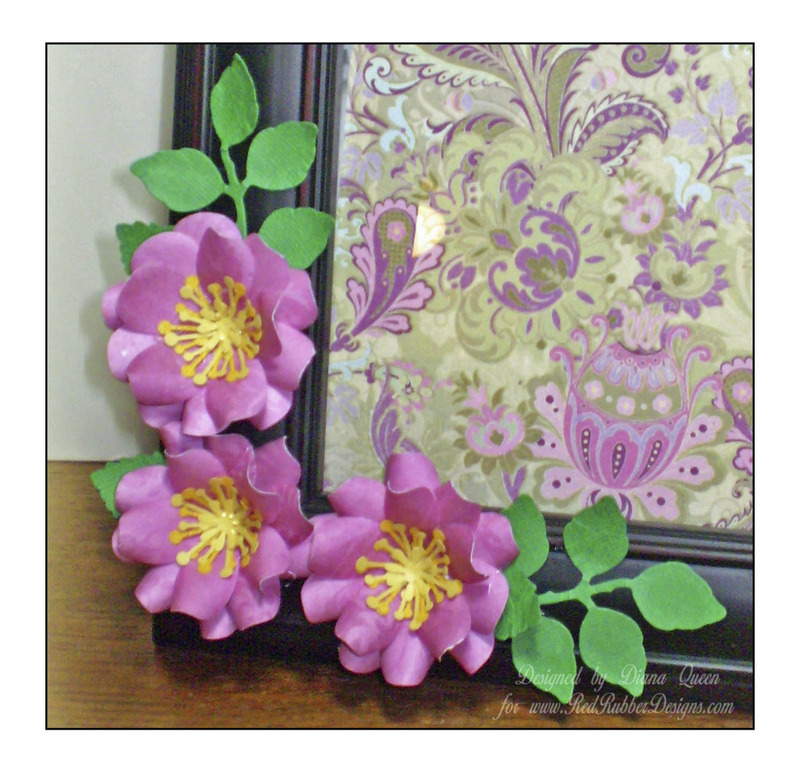 Stamp a background or element pattern on your paper before punching the flowers out and create beautiful and unique custom flowers!